Total Workshop search results: 3. 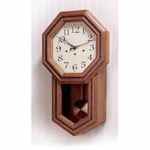 Displaying Page 1 of your woodworking search phrase TALL CASE CLOCK. Maybe you can not save time in a bottle, but you can build this beautiful clock to track its passage. 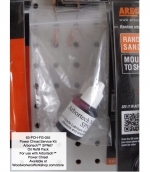 Dress up a simply mitered case with a few shop-made moldings, then install an inexpensive battery powered clock works sourced at the end of the article. We will even show you how to stack router-made profiles to create attractive moldings. A tall clock is one of those heirloom pieces of furniture that end up getting passed down through the generations. 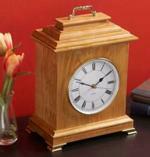 The Shaker clock is unadorned and classic in form. The sides are glued and nailed into rabbets cut in the case front. The back is screwed on, and the case is joined to the base with dowels. There is no better time to build this beauty. :) If you have visited lots of antique shops, chances are you have seen a variation or two of this traditionally styled octagon clock. Here, both the clock surround and the lower long-drop case in which the pendulum swings feature attractive inlay banding. For the works, you can choose between a more expensive spring-wound movement or a less expensive quartz movement that employs a battery. Approximately 19 inches tall.